We covered in detail Fiori for S/4HANA – Fundamentals and best practices during Blog 1, let us now prepare to implementing SAP Fiori. As a general recommendation, when planning a Fiori for S/4HANA Project you should start by reading through the available documentation. Once you decide on doing so, you will find that there are various documents and may find it difficult to determine where to start. Note: Select the correct guide according to your FPS/SPS level, more information can be found on the SAP S/4HANA Overview main page. High level information related to configuration steps needed to setup Fiori infrastructure and post conversion activities. Use Administration guide for new installations (greenfield) with Best Practices relying on the MA… guides for specific configuration steps. Detailed step by step activities and configuration steps related to Fiori infrastructure and landscape setup configuration. Useful for trouble shooting, root cause analysis and as a first step to identify missing configurations. NOTE – You may still refer to the configuration guides with S/4HANA 1809 or lower, however, starting with 1809 rapid activation using task lists is preferred as described in note 2704570, following the architecture recommendation for embedded deployments in S/4HANA. 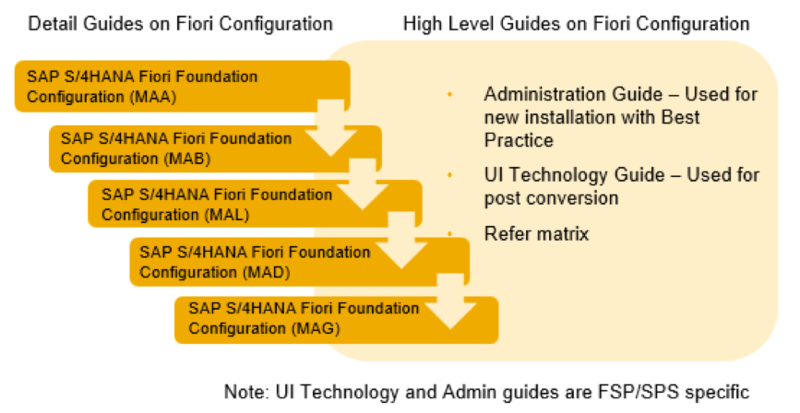 When you go through the MAA, MAB, MAD, MAG, MAL guides you will find out detailed step by step activities around Fiori infrastructure and landscape setup configuration. On the other hand, in the Administration and UI Technology guides you will find high level information around the configuration steps needed to setup Fiori infrastructure. Use Technology Guide for post conversion activities relying on the MAA, MAB, MAD, MAG, MAL guides for specific configuration steps. For troubleshooting, always consider reviewing the steps outlined in the MAA, MAB, MAD, MAG, MAL guides as a first step to identify missing configurations. Many thanks for putting it together. Could you pls tell t if there is a best practice guide for configuring notifications on s4Hana 1610 . ThankQ you so much for the info. Unable to open MAG and MAL guides, can you please help me. Could you please let me know whether these configuraiton guides are applicable for 1809 FPS01 ? Hi, are the Configuration Guides valid for 1809? I am especially interessted in MAA. For S4HANA 1809 not valid anymore. You can’t find this MAA, MAB, MAC etc in Best Practice anymore. Now 1809 easy for Fiori, see variant S4HANA 1809 Fully-Activated Appliance.